Traveling has gotten quite a bit less convenient over the past decade, especially if you’re packing gadgets. A few years ago, we started to see TSA-friendly laptop bags to help ease the hassle. The big trend now seems to be luggage-like bags, such as Incipio’s $129 Weekender Nylon Travel Bag, designed with your MacBook, iPad, and other gadgets in mind. The Weekender is a bit of a hybrid—it can be used as a briefcase-style bag, a messenger bag, or a backpack—but it has the soul of a piece of carry-on luggage. The bag’s detachable messenger strap has a removable shoulder pad that’s lined with a not-too-sticky grip, while the built-in backpack straps can be tucked into a zippered compartment that runs the vertical length of the back panel. The Weekender’s main compartment stores your clothes and other traveling needs, while a separate, exterior compartment fits a padded, removable sleeve designed to fit laptops up to 17 inches in size. A smaller, zippered compartment on the very top of the bag can fit an iPad and other smaller items, and a felt-lined media pocket near the Weekender’s top handle welcomes your iPhone. Two zippered pockets on the back round out your storage options. One pocket runs the width of the bag and is good for magazines and other quick-access items. The other pocket is the aforementioned backpack-strap storage area—when not storing those straps, this long, vertical pocket can be used to store thin items, or perhaps a light garment or weather shell, as long as you don’t mind squeezing the item between the bag and your back. All of the bag’s zippers are weatherproof. The Weekender has a few drawbacks, but they’re mostly minor niggles. Smaller items really only have a place in the top-most zippered compartment, but there are zero pockets or pouches inside that compartment for keeping items in place. The notebook compartment’s opening feels a little tight, making it at times more difficult than it could be to remove the notebook sleeve. Finally, the clips for the bag’s shoulder strap also feel a little cheap, though I don’t have reason to distrust them for a decent life of the bag. Overall, I like the Weekender, which made it easy to pack for a weekend trip—and even a most-of-the-week trip if I pushed it. While the backpack straps are a bit narrower than I would have liked, they’re padded well; I wasn’t able to take a flight or a longer trip during my testing, but I don’t foresee any fatigue from wearing the bag as a backpack. Besides my complaint about pockets for smaller items, Incipio struck a good balance between a backpack, a messenger bag, and carry-on luggage. The Weekender offers solid construction and a comfortable design that lets you bring all your travel gear—clothes, gadgets, and gear—in a single, roomy bag. 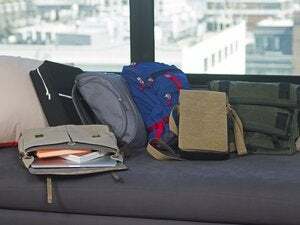 Former Macworld associate editor David Chartier is a Herald for 1Password, chief wrangler of Wind on a Leaf and the Finer Things in Tech, and eternally searching for the perfect bag.